"I bought KeyGhost because I can't afford to lose a single thing I type. KeyGhost just reduced my stress almost 100%! 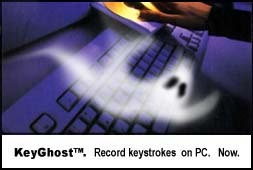 If you own Windows, you have to have KeyGhost :-) Reichart..."
"Got the KeyGhost yesterday. It is awesome. I tested it out on the Emachines box and, I also tested it on an Athlon 50 machine that was setup with a FIC SD-11 Motherboard (Modified AMI BIOS) running Windows 2000 Pro, and I also tested it out on an MSI 6119 (BX2 chipset board) running an Award BIOS. It sure seems to work well and like you advertise, it is a transparent device from a resource usage perspective. Regards, JD"
"works like a charm! excellent product ... I sometimes have 12-14h/day in front of the screen ... thanks again, cheers, h."
"The KeyGhost is a marvel of modern engineering and programming. The amount of memory in the device is limited by its size (a major selling point) and, as a programmer, I know that restraints imposed by the available memory make the software difficult to program successfully. The KeyGhost, in and of itself, is an incredibly useful device. It installs in a short amount of time and is similarly removed. The amount of storage included in even the Standard model is ample and easily accessible. It allows its default password to be changed and can wipe itself clean in minutes (irrevocably so). The KeyGhost should be a major part of any surveillance implementation. I have personally supervised the usage of my KeyGhost Standard in a variety of settings and the device has always performed impressively. I am currently looking at the other products offered by this company." Russell L. West CEO LightStar TECH. "Timing is an amazing thing. We received the KeyGhost today, and so far it works perfectly." Forgive my expletive, but what else can I say .. I mean type. "I've tested the keyghost and it works perfectly. I'm extremely happy with it and will certainly recommend you guys to anyone interested in a product with the keyghosts abilities and excellent customer service to match. Check out some independent reviews of our KeyGhost products. We respect your privacy and security. If you have any questions or comments about this site? Contact the Webmaster. Tel: +64 3 379-3883. Fax: +64 3 379-3885. Email: HelpDesk@keyghost.com. Postal Address: KeyGhost Ltd, P.O.Box 3279, Christchurch 8001, New Zealand. Physical Address: 109 Montreal Street, Christchurch, New Zealand.